Leading dancers and prima ballerinas of Cuba’s National Ballet Company (BNC) -Viengsay Valdés, Sadaise Arencibia, Dani Hernández and soloist Raúl Abreu- will interpret a varied repertoire in the 10th International Ballet Festival of Cali, Colombia. Under the artistic direction of Gloria Castro, founder of the Colombian Institute of Ballet, the meeting that began today will end on October 7, and will bring together troupes from the South American country, together with companies and specialists of the Czech Republic, Italy, Chile, the Dominican Republic, Uruguay, Argentina and Cuba. 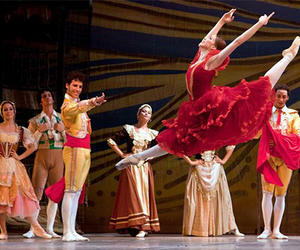 The dancers of the company directed by prima ballerina assoluta Alicia Alonso will interpret the Pas of Deux of Don Quixote and Sleeping Beauty, Double Bounce and Carmen, points out the official Web site of the BNC. According to this portal, performances will take place at municipal theaters as well as at public squares, and the closing ceremony will be held at the Cañaveralejo Bull Square, with a capacity for 15 thousand people.